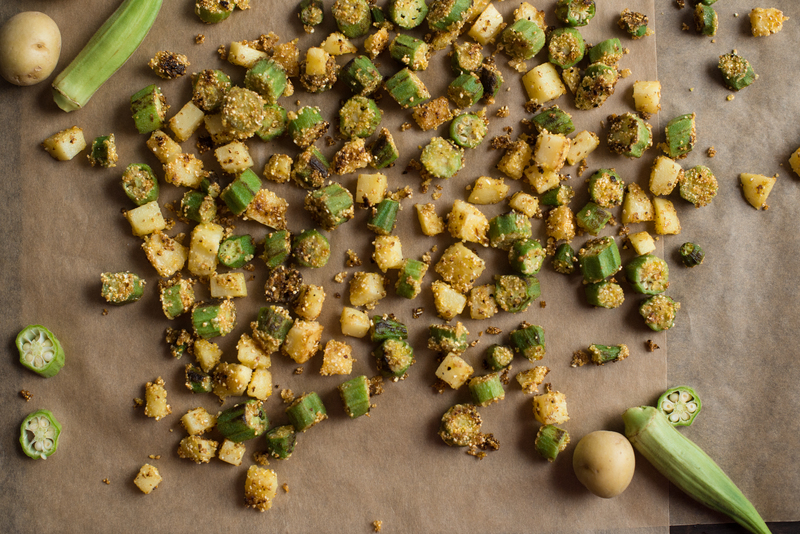 This is a great recipe for those little ones (and grown-ups) who are not sure about okra. I call it “Intro to Okra.” This recipe idea come from my mother-in-law who lives in the South. It uses potatoes and okra lightly dusted in cormeal and then lightly pan fried (not deep fried). The results is okra with a crispy, textures with NO SLIME! Pairing it with potatoes makes the dish a bit more approachable, as most kids love the taste of potatoes (what kid doesn’t love french fries?) One of my tasters would not try the okra and kept grabbing the potatoes and saying, “These are really good!” By mistake she grabbed some okra and kept chewing happily. After she swallowed it, I said to her, “You know you just ate okra, right?” Hilarious! She didn’t seem to care and kept eating! One of the teachers at my kids’ school has had a longstanding fear of okra. After trying this dish she declared, “This is REALLY good!” I’m convinced that okra haters will think twice after trying this recipe! Although cornmeal is gluten-free, make sure you read the label. If you are particularly sensitive and cross-contamination is a concern, consider a certified gluten-free cornmeal. Combine cornmeal salt, black pepper and cayenne pepper in a large bowl. Toss in okra and potatoes to coat. In a large skillet (I use a cast iron skillet) cover the entire bottome with a thin layer of oil and heat on medium. Place okra/potato mixture in the pan and cook, tossing occasionally until potatoes are slightly browned and cooked through (about 5 minutes). Remove onto a plate with paper towel. Serve immediately for best taste and texture. The size small size and soft texture of the okra and potatoes make this a great dish for older finger-food eaters with a few teeth. Cut larger okra pieces into half or quarters. Also, go easy on the cayenne pepper!